Participants at a recent STREAM Girls event held in South Carolina get their feet wet. Trout Unlimited photo. Composer Aaron Copland was so inspired by Appalachian spring he wrote a symphony about it. Countless other artists and musicians have also found their muses once the days lengthen and the very seams of the earth burst with the green of new growth. May apples, trout lilies, redbuds, dogwood, bloodroot, trilliums, wild violets, rue anemone, Dutchman’s breeches, squirrel corn — the list goes on. When you take a walk in the woods in Appalachia’s southern highlands, you are stepping through one of the most biodiverse places on the planet. The forests seem to literally vibrate with life. 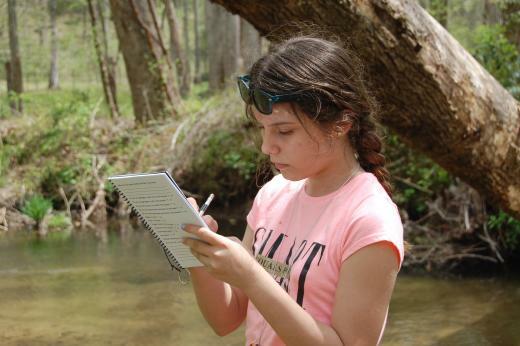 A STREAM Girls participant records her observations during the recent event in South Carolina. Trout Unlimited photo. It comes as no surprise, then, that spring is a wonderful time to get kids outside. There is so much to discover, so many things to see, touch, hear and experience. This vernal world is not only a reminder of the wildness beyond smartphones, tablets, and other screens, it embodies the hope that, no matter how we royally screw it up, the planet will bounce back, recover, be reborn. STREAM Girls is one way that TU is trying to celebrate the natural world. 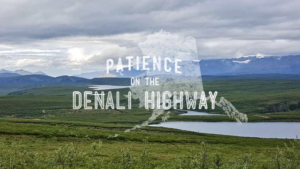 This two-day program encourages girls to see their watershed through the eyes of an artist, a scientist, and an angler. The program is based on STEM values but adds arts and recreation to the mix. 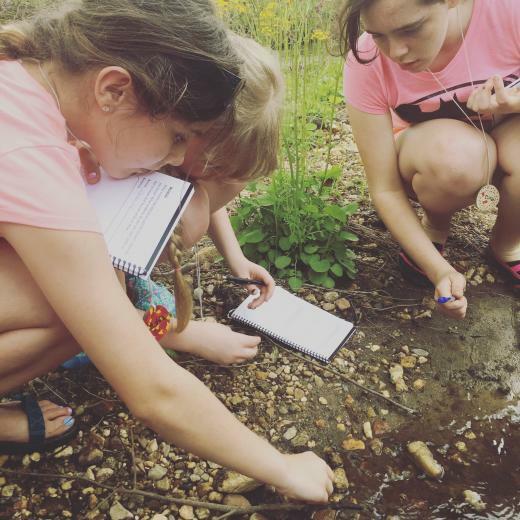 The girls participate in a stream assessment, learn the basics of casting and fly tying, and inventory macro invertebrates. 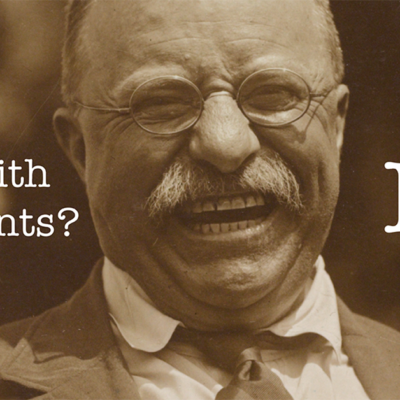 They also journal, sketch, and, of course, fish. 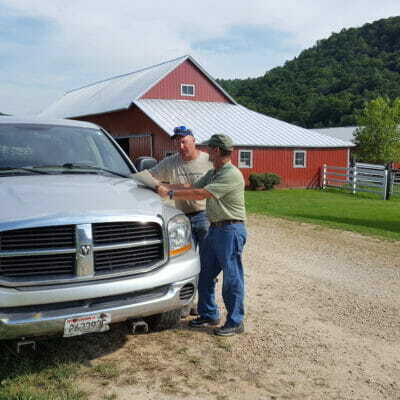 Piloted in Wisconsin in 2013, STREAM Girls has been adopted by TU volunteers and staff in Washington, Oregon, Arizona, Michigan, and Pennsylvania, with additional states coming on line this summer and fall. 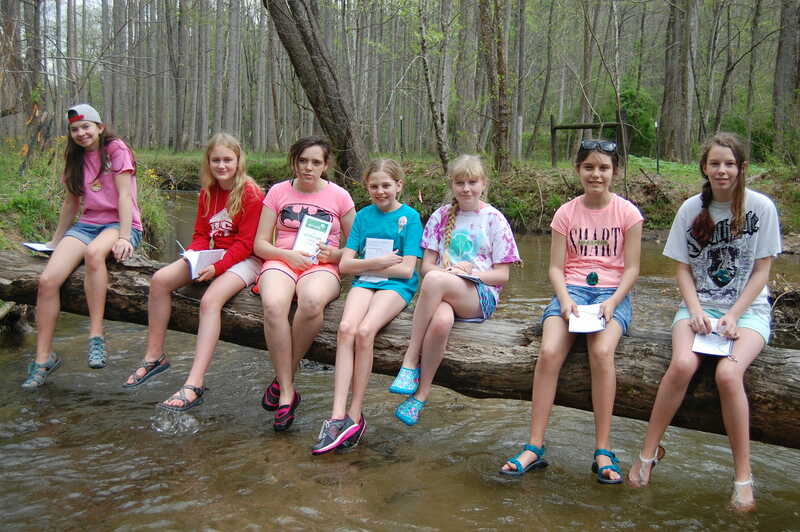 Participants in a STREAM Girls event in South Carolina explore the banks. Trout Unlimited photo. This spring marks the third that a troop of scouts from South Carolina’s Mountains to Midland Girl Scouts Council have gathered at Camp Wabak for a weekend of STREAM Girls. TU’s Headwaters staff, along with volunteers from the Pisgah Chapter of NC, run the program on the waters of nearby Gap Creek and help the girls fulfill the eight core requirements needed to earn a STREAM Girls patch. The girls’ time on the creek this year was perfectly synchronized with a prolific dragonfly hatch. Everywhere they looked streamside, girls found discarded nymph husks — or exuvias —with a baby adult dragonfly perched on top, new wings still folded back like a stonefly. The favorite STREAM Girls activity soon became letting the dragonfly perch on index fingers long enough that the young adults tested their wings and launched into inaugural flight. Goodbye, Steve the Dragonfly! 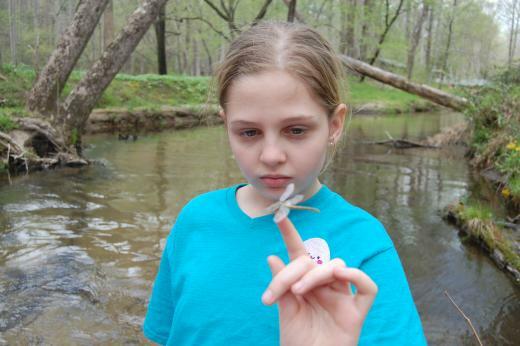 A STREAM Girls participant makes friends with a dragonfly. Trout Unlimited photo. Trout Unlimited’s Headwaters staff could not do programs like this without the help of the GRTU Tomorrow Fund. 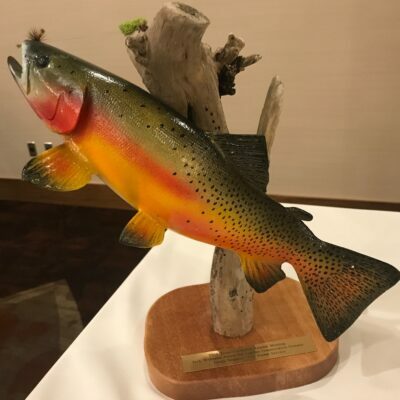 In 2017, members of our largest chapter, Guadalupe River Trout Unlimited (GRTU) in Texas, demonstrated an enormous amount of passion and commitment by establishing the GRTU Tomorrow Fund. The sole purpose of this annual $10K Fund is to raise money for Headwaters, which is built around the premise that TU has something to offer any and all young people. Franklin Tate is Director of Trout Unlimited’s Headwaters Youth Program. He is based out of Asheville, North Carolina.